Features -Tip applicator,made of rust-proof metal, easy to put a thin line of adhesive for your handcraft, make your craft more exquisite and beautiful -Bottle is made of soft plastic, easy to squeeze, small shape, easy to store, reusable and washable -Have a little tip cover which do a good job of preventing the liquid dry up -Come with 5 PCS mini funnel, a great auxiliary tools for adding the thin liquid -15 PCS tip applicator bottle with colored tips , help to distinguish different use, will meet your kinds of handicraft need Specification Material Bottle: soft flexible plastic Tips: rust-proof metal Mini Funnel: durable plastic Size Bottle: upper caliber 0.8 cm, bottom diameter 3 cm, height 9 cm Mini Funnel Size: upper caliber: 2.65 cm, lower caliber: 0.5 cm Color Bottle: translucent Tips: yellow, orange, white, black, red(each color 3 pcs) Mini Funnel: translucent Bottle Capacity: 1 ounce / 30ml Package 15 x Applicator Bottles with colored tips 5 x mini funnel Caution: 45 days money-back, any questions you have, please don't hesitate to contact us,we will reply you within 24 hours,and will do our best to solve your problem. Each of us has an imaginator within us, who loves to create! From a scary alien to beautiful princess be it 2D or 3D. The desire to make these is now possible with our 7 towers. The ultimate border buddy is here. 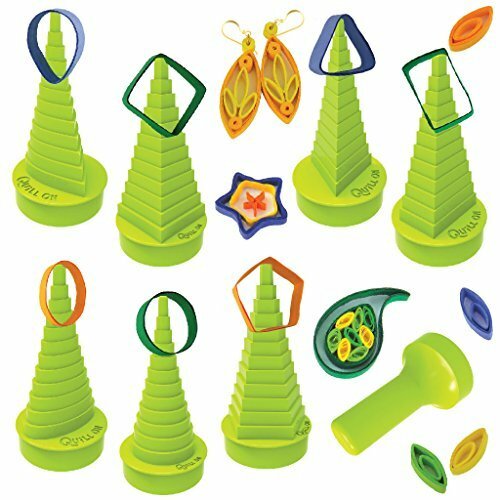 First of its kind, this border buddy set comes with 7 towers that can help make more than 25 different shape. Not only this, the ultimate border buddy also offers a much wider selection in terms of size. Each tower has 12 size options to choose from so that you can get the apt size of border for your creation. This tool is a necessity for every Quiller as it helps you to quill like an expert. This ultimate border buddy helps you to make border in 3 easy steps Step 1: roll the strip Take a Quilling strip and start rolling around the shape tower that you have selected. Step 2: Glue at intervals Add some glue after every round, so that your loop is able to retain the shape when you are trying to remove it. Step 3: Remove gently After you have got the desired thickness carefully remove the loop from the border buddy and voila, you're done!! Useful in wide variety of applications - from making Quilling Earrings to Quilling Flowers or even 3D Quilling objects There are 2 great ways of using the borders - make nested border shapes or combine the borders with paper Quilling coils. For best results we recommend you to use Quilon sticky back Quilling strips as they have apt and evenly spread thickness. Please keep away from children under 3 years old. Remarks: New and old products are shipped randomly. 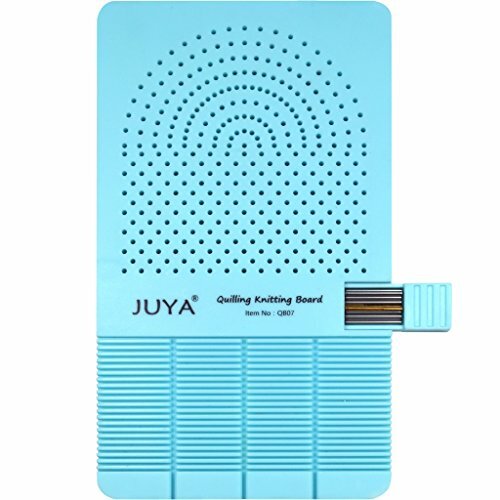 Juya Quilling Knitting Board with 2 Functions have Sticks Storage This is a quilling diy board, twine the strip to make different shapes. Based on your design, you can put the stick in the corresponding holes, then twine the paper, firstly from the middle postion, then each left and right side, glue for each coil, twine, glue, twine, glue...finish a petal, then glue petals together to be a flower... The kintting board is made by ABS plastic, four corners are rounded. Stick is made by stainless steel, slotted stick is made by copper, copper stick's gold color easily find in the all sticks. Convenient storage: the board with own drawer, will not lost the sticks. Dimension of bottle: 3.5" in total height, 1.2" in diameter. 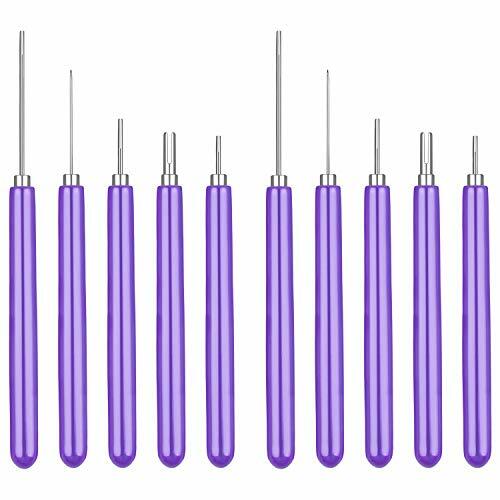 Package include: 10pcs needle tip bottle. Made of PE plastic material, possessed good sealability, no leaking and lightweight, suitable for glue, glaze, paint, or other liquids filling. 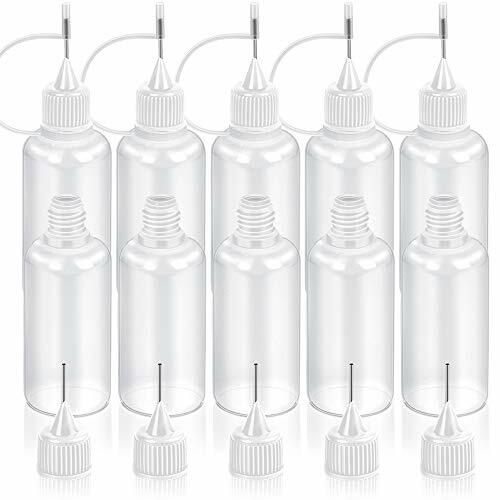 Each bottle has a firmly fit tip cap, cover the tip well, protect the tip and keep liquid from leaking out. AVOID SUNLIGHT and HIGH temperature after fill with glue due to the material of product. Please stay away from children under 3 years old. Small parts in needle bottles will be dangerous. 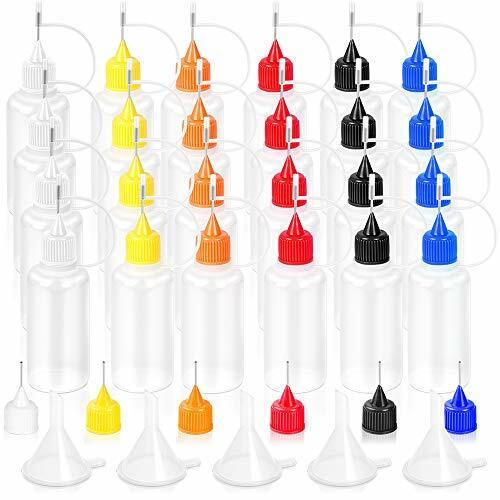 If you are satisfied with our products, please press the " Add to Cart " button and buy our Needle Tip Bottles. PERFECT MATERIAL: Bottle body is made of PE plastic, 0.4 inch length preision tip is made of rust proof metal. Resuable, washble, and easy to use. 0.4 inch Dia needle tip and the bottle height is 2.7 inches. DEPENDABLE PERFORMANCE: The tip is made from rust-proof metal, durable; And the bottle is made of a soft flexible PE plastic, squeezes easily. Easily focus to dropper. 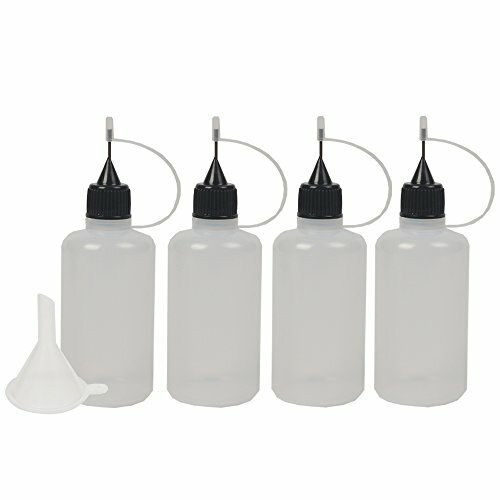 Soft silicone loops: each bottle has a firmly fit tip cap, cover the tip well, protect the tip and keep liquid from leaking out. 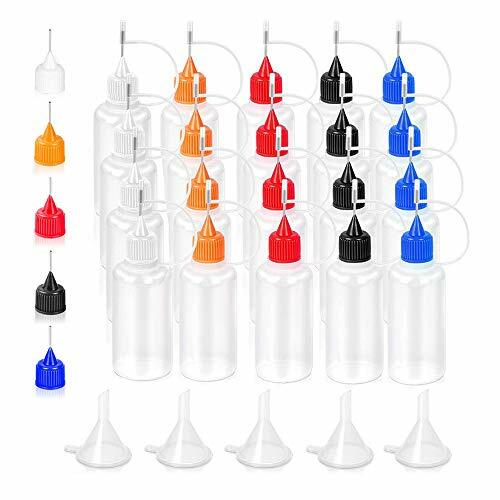 NEEDLE TIP GLUE BOTTLE: 0.4 inch Dia needle tip WITH PRECISION DROP, good tools for quilling and other projects that require small drops or fine lines of glue; Can be filled with glue, glaze, paint, or other liquids. 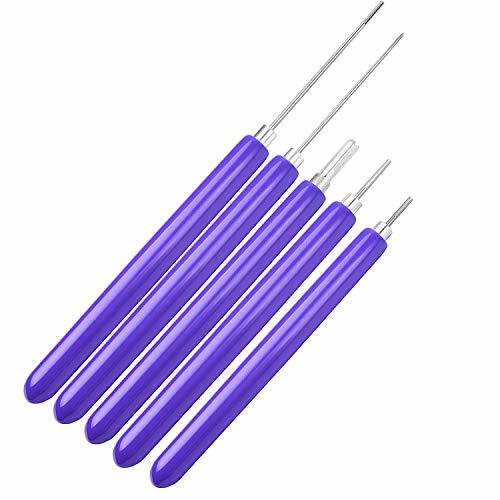 VARIOUS USE RANGE: It is a seful tool for quilling and other projects and can use to hold glue, glaze, paint, or other liquids. It is also can be washed and sterilised for reuse. USING TIPS: AVOID SUNLIGHT and HIGH temperature after fill with glue. Because the glue will be easily dry. You can press it softly according to your needs. Packed by a plastic bag with 10 pcs bottles. 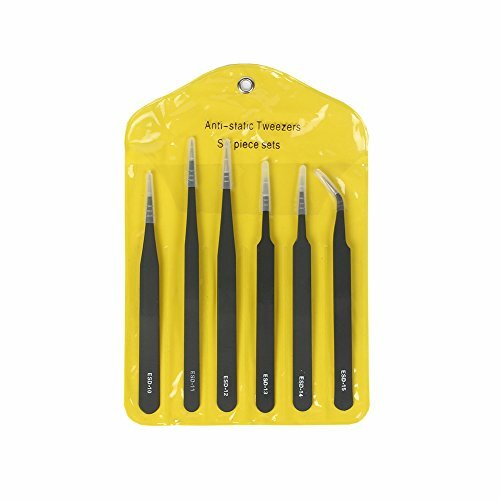 Handy set of tools,perfect for quilling craft. 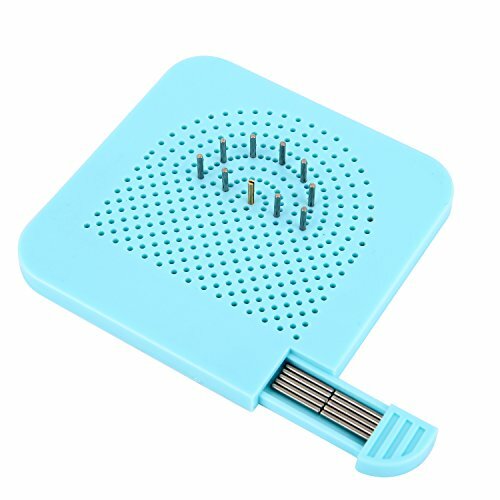 There are abundant holes to fix the pins; Half of the holes are in row arrangement, the rest of the holes are in half round arrangement. The quilling board shape is a square; There is a mini drawer to storage the pins; The drawer has some stripe textures which make you easier to open. The quilling paper set support you to make various shapes of paper quilling which is good for card, packaging decoration, decorative painting, ornaments, etc. Design the paper quilling work shapes and sizes at first, put the pins in the corresponding holes, tangle the paper, and then remove the crafting paper. The paper should be rolled from inside to outside, then you should glue to each coil, lastly finalize the design. Application: the quilling board kit support you to make various shapes of paper quilling which is good for card, packaging decoration, decorative painting, ornaments, etc. 1.One head with 6mm slotted. 2.One head with 10mm slotted. 3.Two head with 6mm slotted and a embossing head. 4.Two head with 10mm slotted and a embossing head. 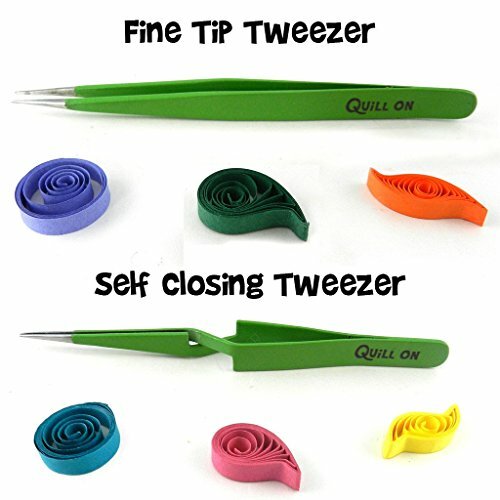 If you are a Crafter or Quiller looking for enhancing precision and neatness, then our set of 2 QuillOn Quilling Tweezer is a must have in your Quilling Kit. 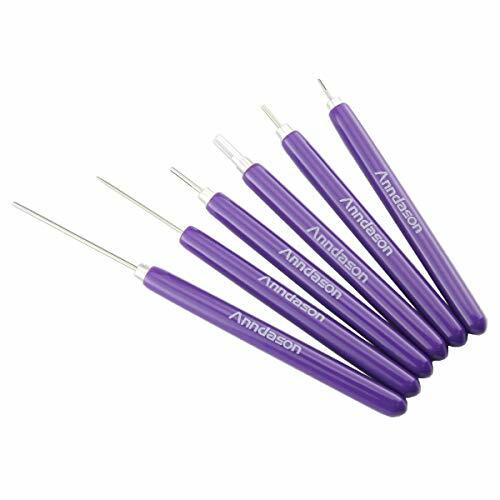 FINE TIP TWEESER: The super fine tip gives the Tweezer must-have reach and precision for all the minute detailing of your Quilling project. SELF-LOCKING TWEASER: The self-lock feature is ideal for gluing parts that need to be held together for a few moments as the glue dries Self - locking tweezers work by reverse action - Press the Tweezer to open it, release it to keep the items held. Also called self - closing Tweezer or reverse Tweezer The self-locking provide the right amount of Pressure needed to keep the items held together without having to keep holding the Tweezer. The self-lock is ideal for gluing parts that need to be held together for a few moments as the glue dries. 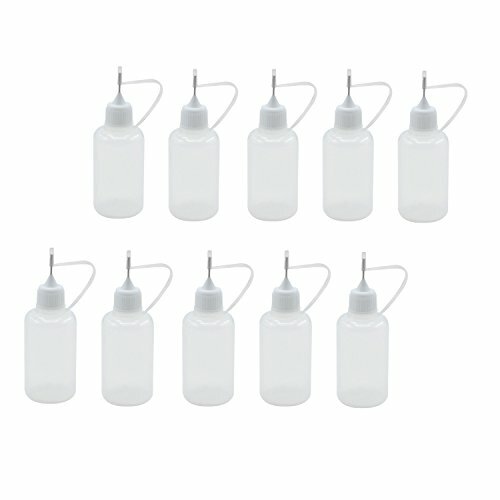 PACKAGE INCLUDES: 10 Pack (10 Bottles & 10 Tips) 1 Ounce/30ml Bottles. 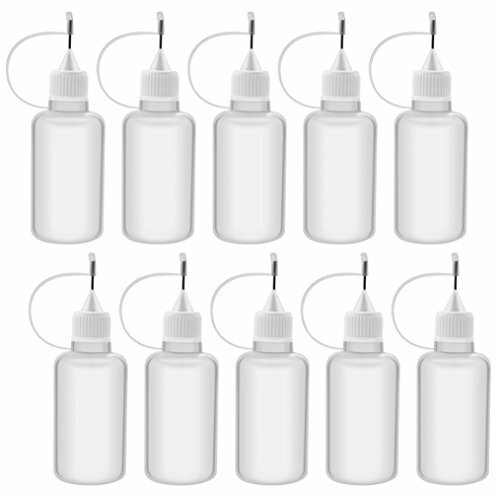 The fine tip applicator bottle holds 1 ounce/30ml of liquid, measures 3.62"/9.2cm in height and 1.18"/3cm in diameter. 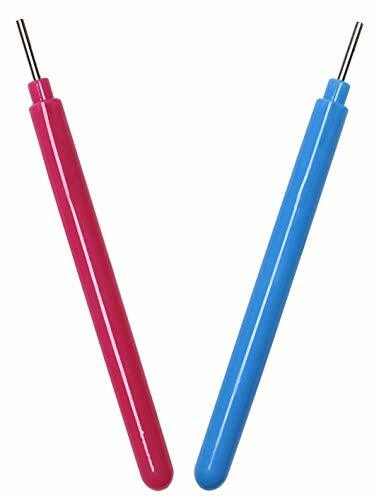 The length for the metal tip is about 1cm. Super Quiller and Buddies is a fascinating set of craft tools and a must have for every craft lover. 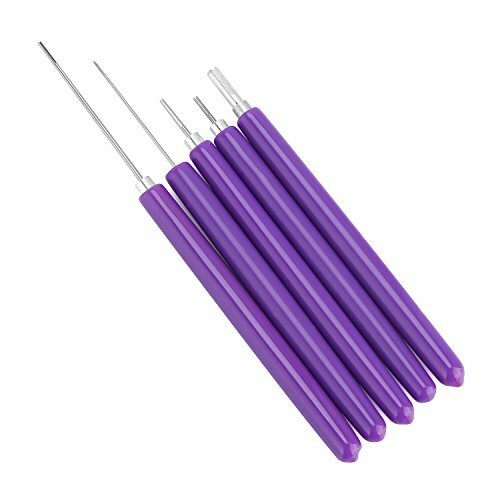 Coil like an expert with this world's first motorized multifunctional Quilling tool. Quilling was never so easy before! 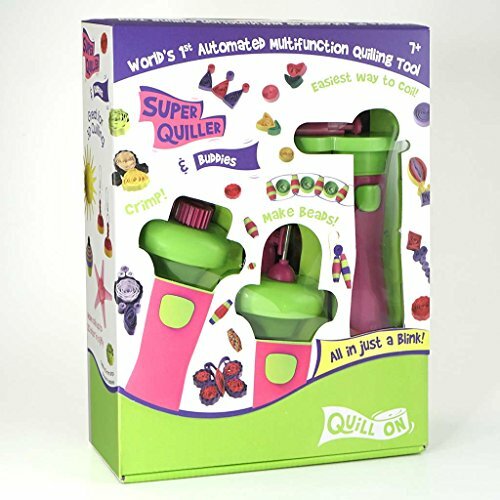 Now with this motorized Super Quiller makes Coils in a jiffy. 1) EASY QUILLING DISC: Start by using Easy Quilling Disc if you are beginner. The Easy Quilling Disc helps you to make coils in jiffy as -all you have to do is insert the paper in the slot and press the button to makes coils with just one hand. You can coil up to 2-3 strips using the Easy quilling disc that will be sufficient for most of the Quilling projects that you may take up as a beginner. As you gain comfort, you can start playing around with attachments to open up a whole new world of creative possibilities. 2) JUMBO QUILLING DISC: Then you can try using the Jumbo quilling disc, wherein you can make coils of up to 20 strips of 10 mm that can be used for making different 3D Quilled objects such as Jhumka, Dolls etc, to take your quilling skills to next level. 3) THE BEADING BUDDY ATTACHMENT: You can make beautiful paper beads using the Beading Buddy with some specially designed beading strips. Using the beading attachment- you can make fascinating and colorful paper jewelry. 4) THE CRIMPING BUDDY ATTACHMENT: A fun and valuable attachment for your Super Quiller - to enable you - to Crimp in seconds. The crimping buddy helps you give a crooked and fun look to your creations such as Animals, Flowers or other objects as you can crimp paper up to 10 mm wide. Give a zig-zag crimped effect to your quilled strips using the Crimping Buddy. Use the crimped strips to make great borders or add a stand out look to your coil. The tool runs on 2 AA batteries of any available brand. Once you have a hang of the system you can begin offering life to your imaginative thoughts utilizing this unique arts and craft kit. Essential paper craft tools are important tools when you plan to do various kinds of paper creations.They helps to fulfill your idea expression on craft projects quicker and easier.See how far you can push your creativity with the help of these tools. Quantity: 2 Sets/, 5 Pcs/Set. total 10 pcs. Five sizes slotted tool, suit for much more different size paper strips. This product are great for putting fluids into precise locations such as on tools, firearms, fishing reels, etc. really handy to have. 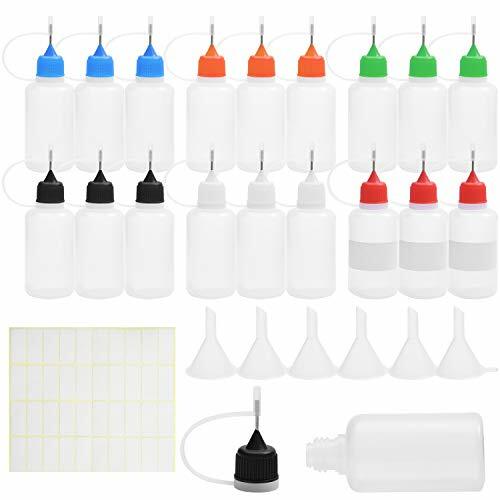 Package Include: 5 different color help you to distinguish the 20 small plastic bottles, 5pcs additional applicator tips allows you replace the damaged tips, 5pcs mini funnel help you to pouring glue into the bottles. 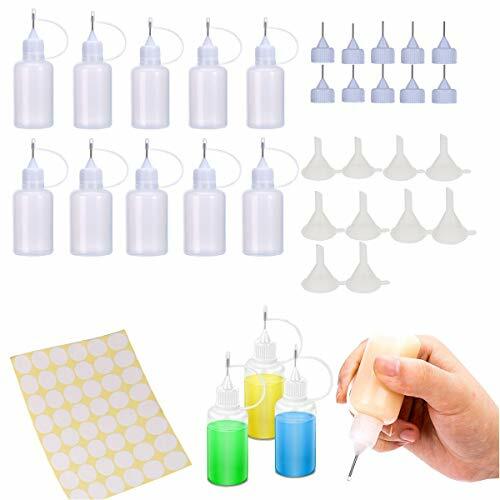 Material: Bottle is made of translucent soft flexible plastic, easy to squeeze; precision tip is made of rust proof metal, caliber only 1mm, just apply to for thin liquid & glues; have a soft tip cover, will do a good job of preventing the liquid dry ups. 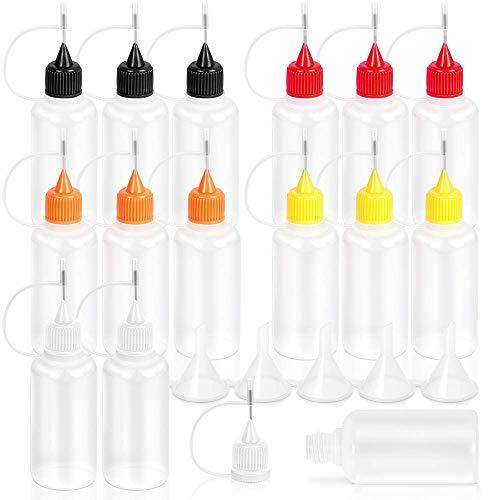 Perfect Tools: 1 ounce soft bottles with fine needle bottle tips, its fine tip is perfect for applying precise amount of glue, great for quilling, paper craft, handicraft and other projects that require small drops. Pay attention: Glue bottle use for quilling supplies and quilling tool. 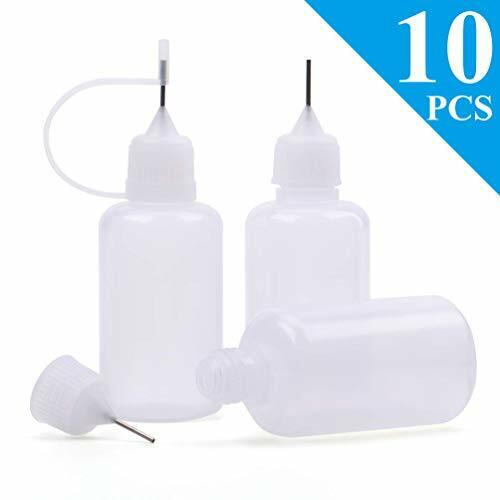 Needle applicator bottle can be used for glue paper. Be sure to use thin liquids and glues since the tip is so small. Tip will clog and bottles won't release liquid if the medium is too thick. 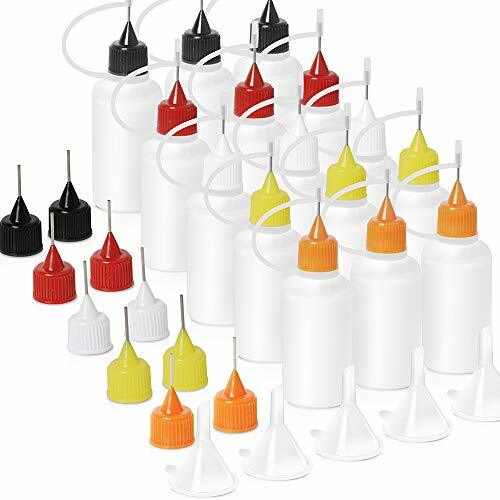 Use occasion: needle oiler bottles for door locks, hinges, clocks, sewing machines, fishing reels, bikes, cleaning guns with oil, optical repair work, coconut oil, castor oil. Fine tip applicator bottle ideal for alcohol ink. 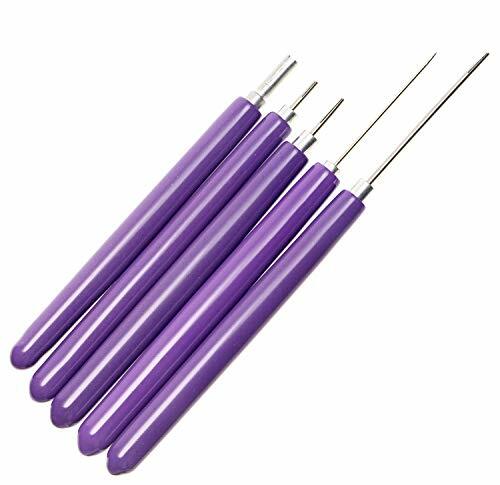 General slotted tool: Groove depth 6.6mm,suit for 3mm/5mm/7mm/10mm quilling paper strips. 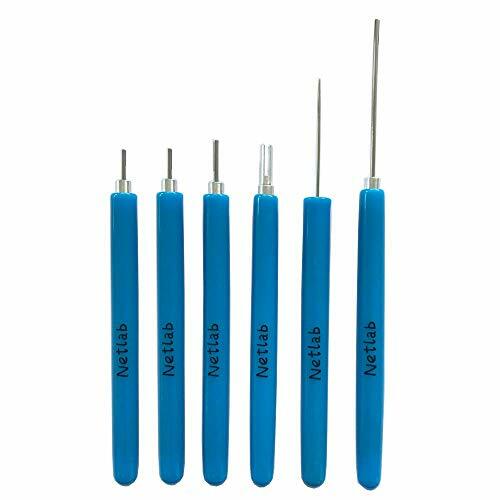 Package included:1pcs Needle Tool, 1pcs Long Slotted Tool, 1pcs Short Slotted Tool, 1pcs Big Slotted Tool, 1pcs 9 mm Slotted Tool. 5 sizes slotted tool, suit for much more different size paper strips, Both small carfts and big projects can be handle easily. 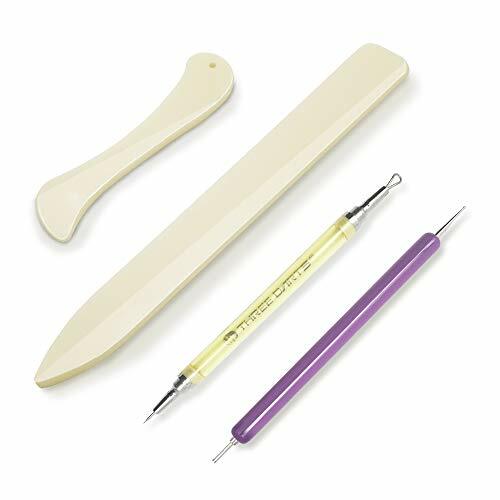 Essential tools for beginning quillers, the tools make it easier to twirl paper and are much more comfortable to hold, can help to apply adhesive glue evenly. Perfect tools for learning the art of quilling. 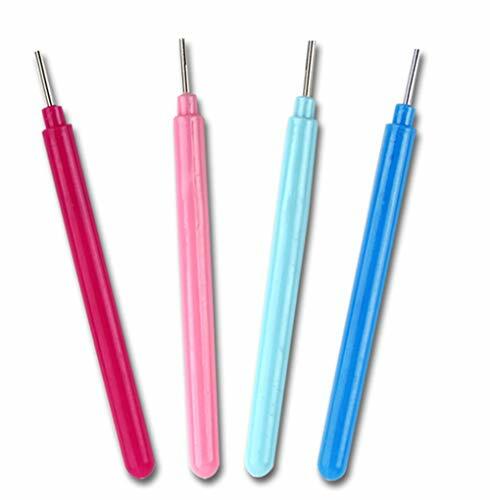 Short Slotted Tool: Groove depth 6.6mm,it is suit for 3mm/5mm/7mm/10mm quilling paper strips. Long Slotted Tool: Groove depth 8mm, lengthened 40mm in the top, for making Special shapes. 9 mm Slotted Tool: Groove depth 9mm, suit for quilling paper strips Wider than 10mm. Big Slotted Tool: for thick paper and several glued strips, stretched out a variety of shapes.